It doesn’t take more than the first few seconds on the Spirit 750 to feel how brilliant of a machine it is. And no wonder: The Shadow Custom Motorcycle is a perfect combination of performance, comfort and Honda technology, all wrapped sleekly into a sporty cruiser package. The V-twin engine provides the power and beautiful hum for all the fun. In between you’ll find a perfect blend of both modern and classic styling touches, such as spoked wheels, plenty of chrome and an unbeatably comfortable riding position. The VT750 Shadow Spirit is sure to attract plenty of attention and envy, too. When it comes to cruising, nothing compares to a V-twin engine. And the Spirit 750 is one of the best: A 750cc powerplant that delivers plenty of torque and a wide powerband. The VT750 Shadow Spirit’s programmed fuel injection (PGM-FI) offers optimal performance in any condition, including cold mornings and high altitudes. And the durable and virtually maintenance-free shaft final drive ensures smooth, dependable power delivery to the asphalt. 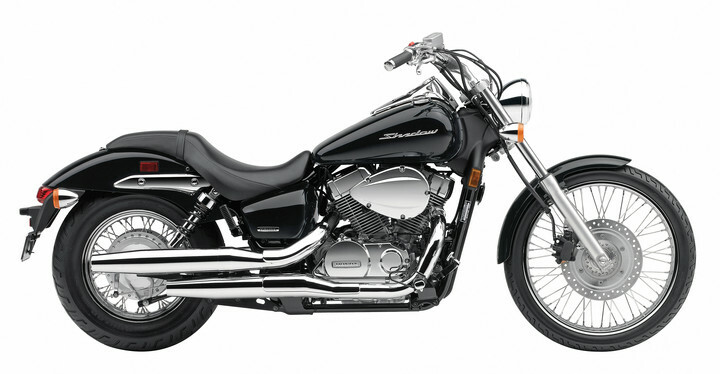 The Spirit 750 is the ultimate in riding comfort. Dual-shock rear suspension and super low seat height really help smooth out the bumps and potholes on your ride. Plus, the broad, low-slung seat design is comfortable for both the rider and passenger. With this much power and easy feel, you’ll want to ride the custom motorcycle all over town, on short commutes or long rides on the weekend.